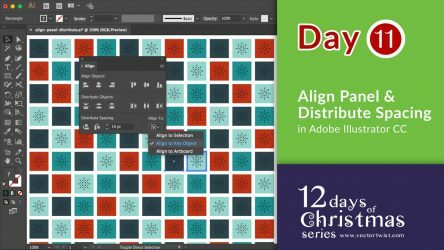 It’s Day 11 of our series “12 Day of Christmas” and today I would like show you how to set a specified amount of space between your objects via the Align Panel. 1. Select the objects you want to align or distribute. 2. In the Align panel, click the fly-out menu on the top right and chose Show Options. 3. In the Align panel, under Align To, select Align to Key Object from the dropdown. 4. Enter the amount of space to appear between objects in the Distribute Spacing text box. 5. Click either the Vertical Distribute Space button or the Horizontal Distribute Space button.